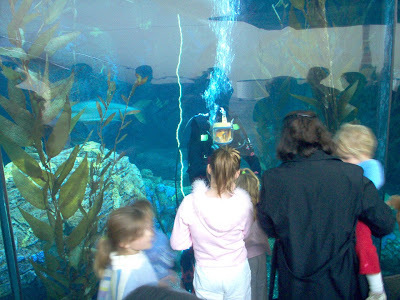 Several years ago my wife and kids joined several homeschool families for a tour of the Union Rescue Mission in downtown Los Angeles. It made a huge impression on my kids and they talked about some of the things for months, really years, afterwards. 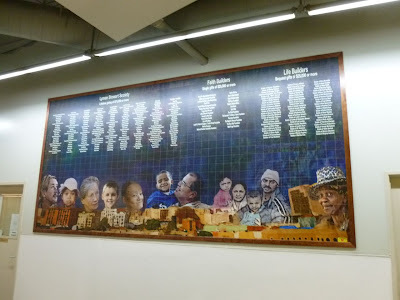 My wife and I have had the privilege of helping support the work of the Union Rescue Mission, and I've had a chance to serve there with friends from church ... but never had an opportunity to actually tour their facilities. 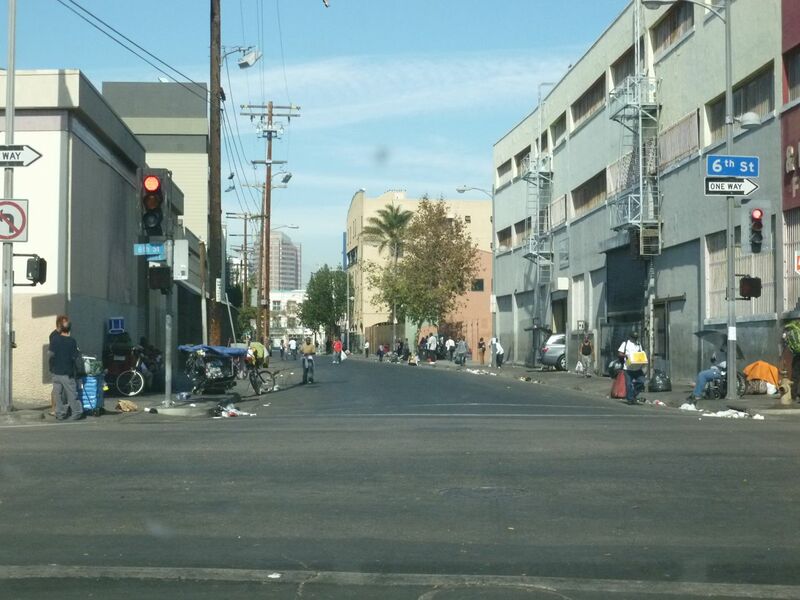 This past Fall I was back in L.A. and made a point to head over to Skid Row - to see first hand all that the Union Rescue Mission is doing. 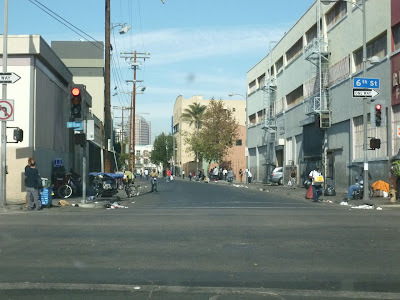 ... ground zero of L.A.'s skid row. I stepped outside on San Pedro Street to take this photograph but was told by the Union Rescue Mission staff not to wander up and down the streets, at least not by myself. In addition to serving thousands of meals every day, over 900 people live in the Union Rescue Mission's massive five story 225,000 square foot facility. What really amazed me was the partnerships the URM has developed with UCLA, USC, and Pepperdine Univerity. 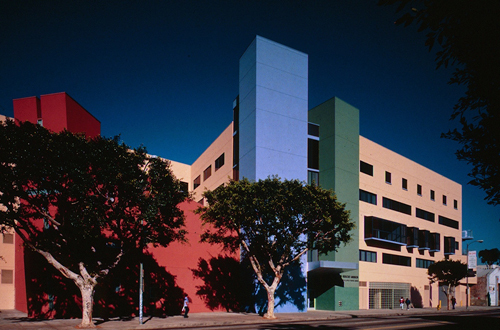 The URM has a medical clinic through a partnership with UCLA, a dental clinic through a partnership with USC, and provides both legal and mental health services through a partnership with Pepperdine University. A friend of mine serves on the Board of Directors for the URM. 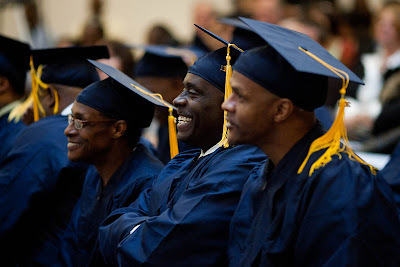 He said the best time to visit is during one of their "graduation" ceremonies - to see men and women who are been part of the URM's one year mentorship program go through a graduation ceremony. 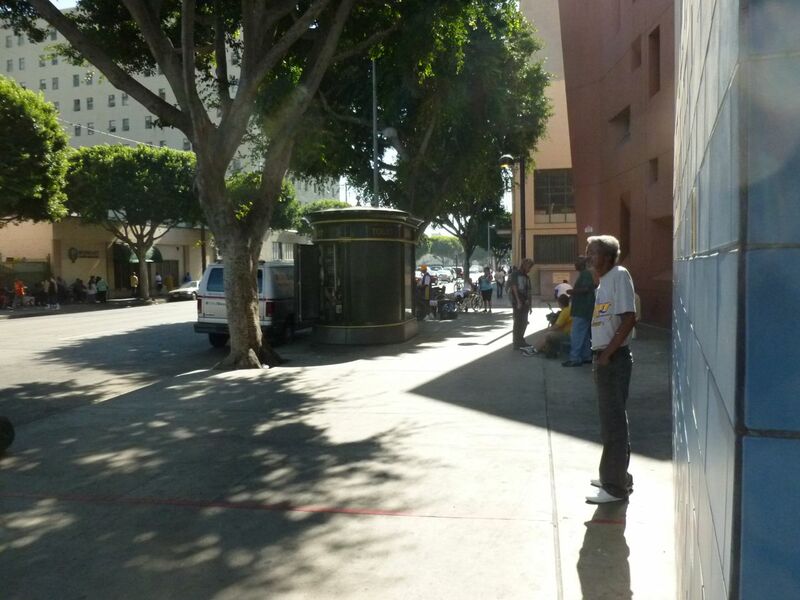 What I love about the URM is that it is a comprehensive program to get people permanently off the streets. Many people living on the streets aren't just homeless - they're unemployable. 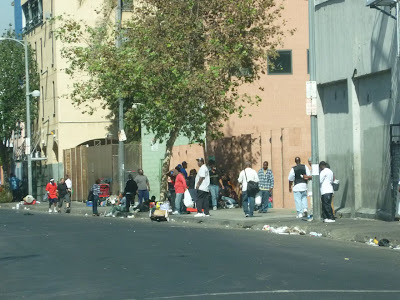 Providing shelter and a meal is only the first step on the long and difficult road to being integrate back into mainstreet society. To be able to get - and keep - a job. The URM has a 66% success rate; similar programs are half that. 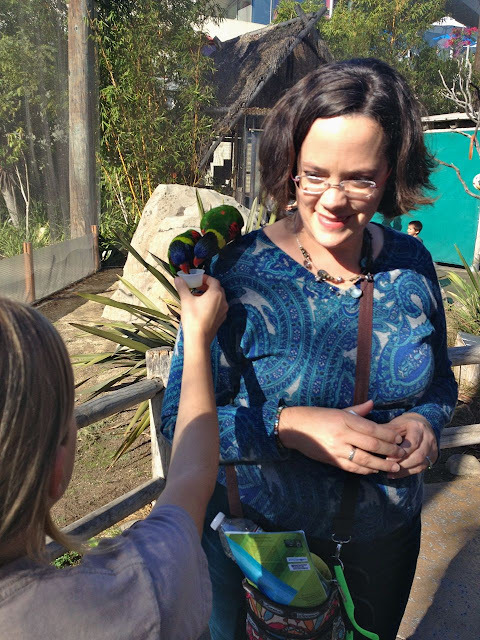 There are numerous opportunities to serve - either for a couple of hours, or on a regular basis. If that's not your thing, there are opportunities to give financially. Maybe it's just me, but rather than giving a pan-handler $20, seems like it makes a whole lot more sense to give an organization working to get men and women permanently off the streets. 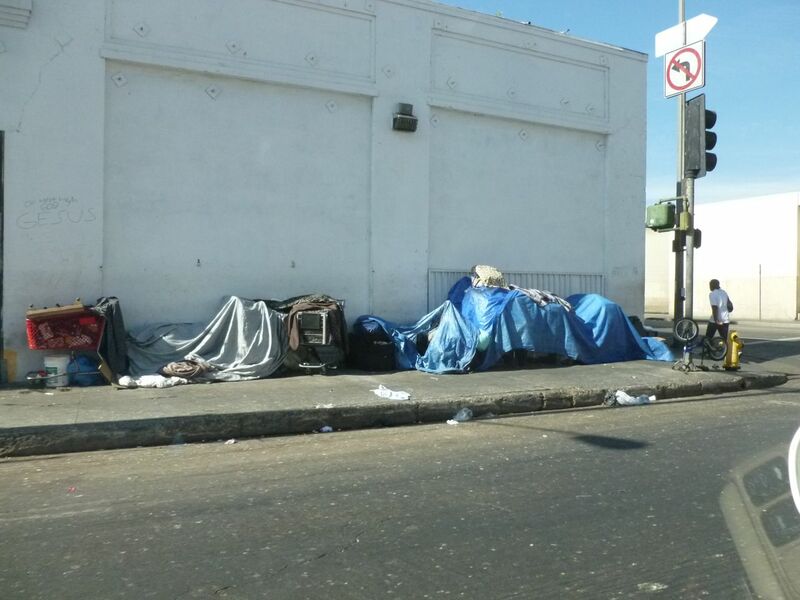 And if not the URM, there are other excellent organizations working on skid row. Walking around the lobby there's a large wall recognizing major financially contributors. I'm glad to actually know of few of these people. 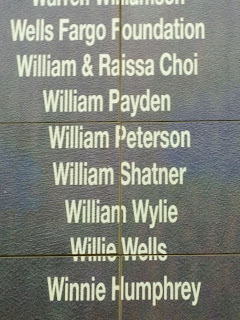 One name that stuck out was none other than William Shatner. 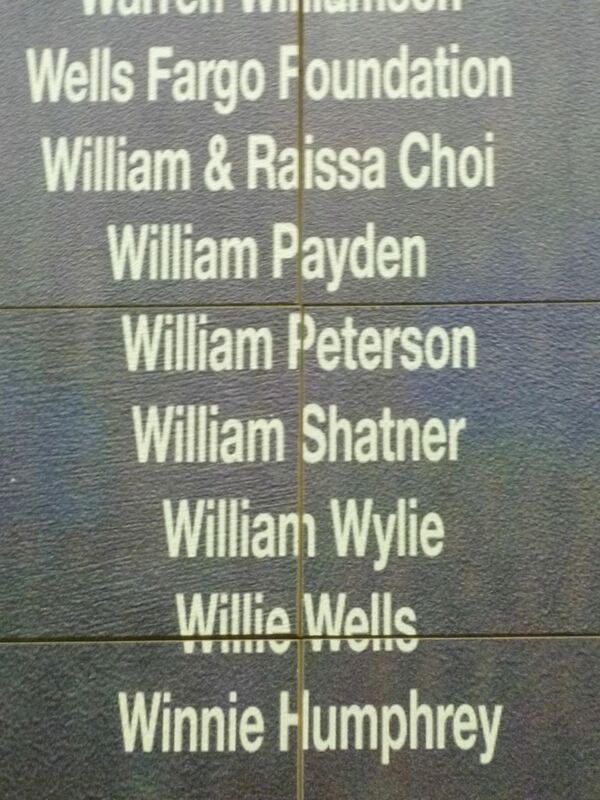 Looks like James T. Kirk likes what the Union Rescue Mission is doing. Nice. Out of respect for the residents, I didn't take a lot of photographs inside. Here's a couple of final pics from outside on the roof. 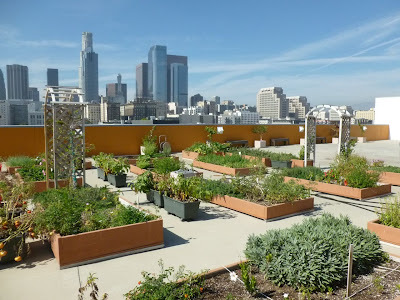 The small roof-top garden is used by those in the program to grow food served to those just in off the streets. During the summer, volunteers set up a project and show movies to the kids living there. 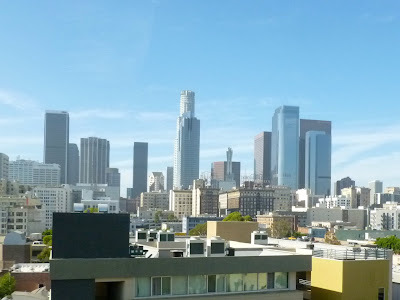 A final view of skyline of Los Angels, looking north from the roof of the Union Rescue Mission. Many thanks to those who serve year in and year out at the URM. Here's a link to their website. 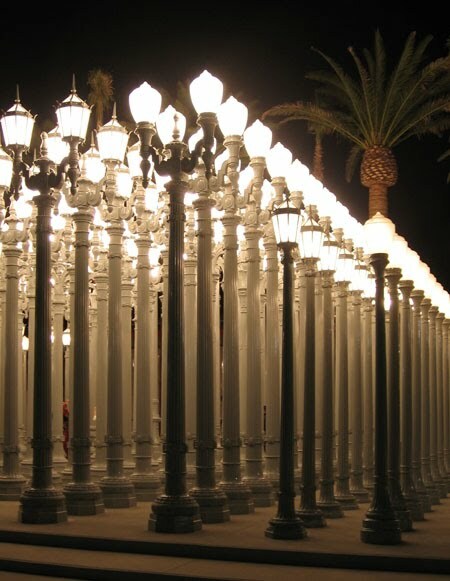 Located outside Los Angeles County Museum of Art (LACMA) on Wilshire Blvd is Chris Burden's outdoor sculpture "Urban Light." 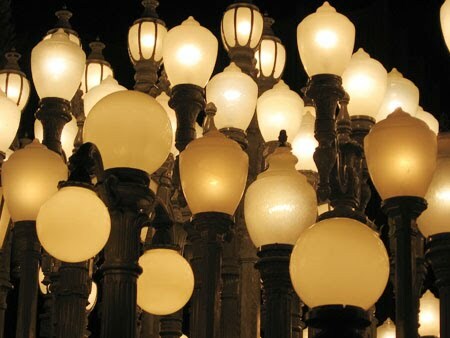 The sculpture consists of over 200 restored vintage light posts from around Los Angeles. 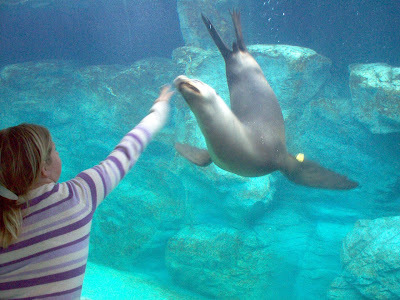 My kids (pictured here in 2008 when they were ages 6 and 8 1/2) and I stopped by a couple of times over the years. Chris Burden is also responsable for LACMA's Metropolis II (which I'd like to blog about sometime soon). The historic lamp posts and the geometric patterns look neat during the day . . .
. . . but the best time to see them is at night. My wife and I were driving along Wilshire Blvd a few years back when I stopped and snapped off a couple quick pics. Wish I had some more time - and a tripod! Here's a link to another site with some significantly better pics of "Urban Light." Hats off to photographer David Palmer. As a Christian, I'm reminded that "light" is use is a metaphor throughout the Scriptures. The first words spoken by God himself are the famous "let there be light" of Genesis 1. John's gospel describes Jesus as "the true light that gives light to every man." Jesus said of himself "I am the light of the world." The last chapter in the Bible describes God himself as the final and ultimate source of light. 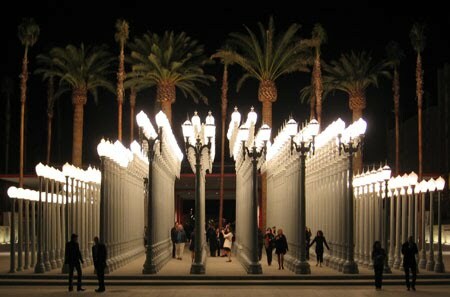 Some friends of mine used a photo of themselves in front of the LACMA light posts for their Christmas card. It's a great pic - and reminds me of yet another way light is used in Scripture: to describe the followers of Jesus Christ. "You are the light of the world" Jesus said to his disciples, and by extension, to those who follow him today. As we approach Christmas, it's a reminder for me to be perhaps less concerned about the twinkling lights around the house, more concerned with my character, my actions, and my involvement in those who Jesus described as "the least of these." Maybe that's the kind of urban light God wants. December 2009, I was driving up the Pacific Coast Highway when I did a double take on what (at 50mph) looked like highway road signs. 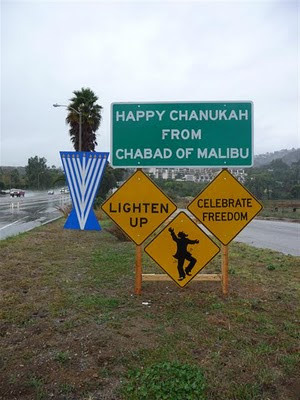 I actually circled back around to get a photo of the green "Happy Chanukah" sign, and the yellow "lighten up," "celebrate freedom" and dancing rabbi signs. Hey, it got me to stop. Outside of New York City, Los Angeles has the largest Jewish community in the world..I'm continually impressed by the impact that Jews - who make up less than 2% of U.S. population - continue to have in American society..As I've shared before I'm convinced that I - and other Christians - can learn from the Jewish community in the sense of impacting the larger society from a minority religious position..Here's another link - this one to comedian Adam Sandler's "Happy Chanukah" song. 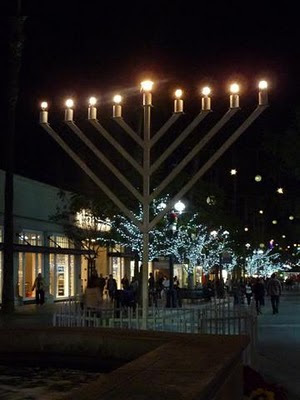 It provides an amazing list of American Jews. 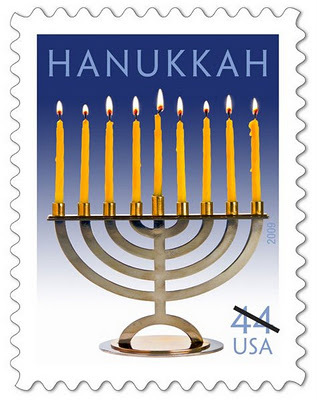 Unknown to many Christians, Hanukkah is clearly mentioned in the New Testament (see John 10:22,23). Here's a fascinating link. 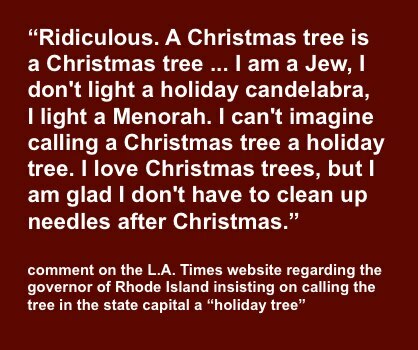 While I recognize that in a pluralistic society, there is a place for "Happy Holidays," it's also disheartening the lengths people go to not say the words "Hanukkah" or "Christmas". I love the comment (above) a week ago from the Los Angeles Times website regarding the governor of New Hampshire insisting on calling the tree in the state capital a "holiday tree." 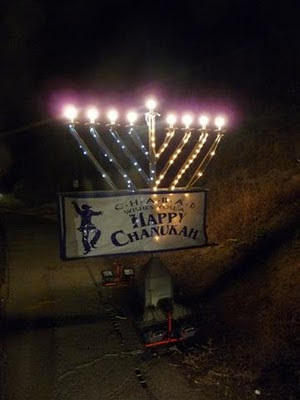 It's a Menorah, not a "holiday candelabra." 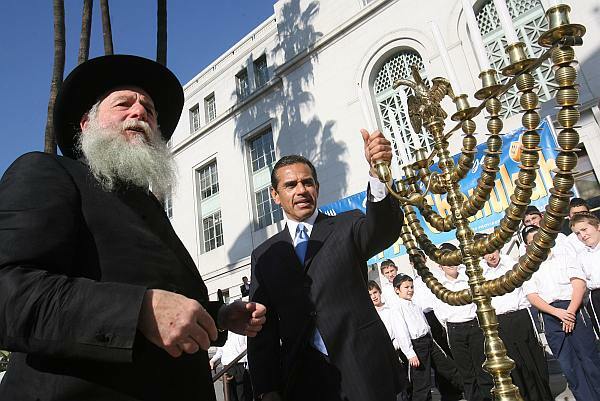 Rabbi Boruch Shlomo Cunin, left, and Los Angeles Mayor Antonio Villaraigosa prepare to light a candle on a menorah during the Chabad Hanukkah Celebration on the steps of City Hall back in 2009. 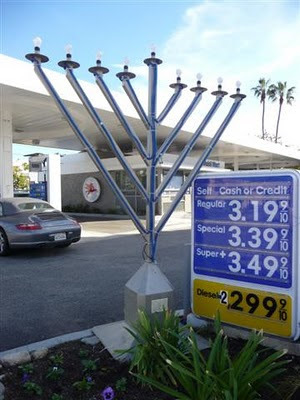 From a non-Jew no longer living in L.A. - wishing everyone a Happy Hanukkah. 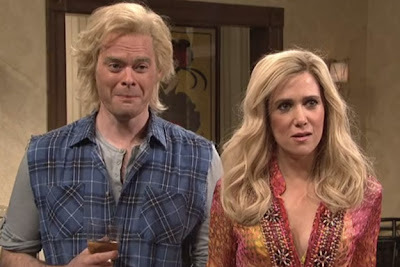 "Saturday Night Live" - the New York based comedy show - recently aired a series of short comedy sketches called "The Californians." It's a five minute routine, in the style of a soap opera, mocking what they (and rest of the world) perceive life to be like in sunny California. I came across this Hulu Version - love how the actors were barely able to not laugh at their ridiculous lines. 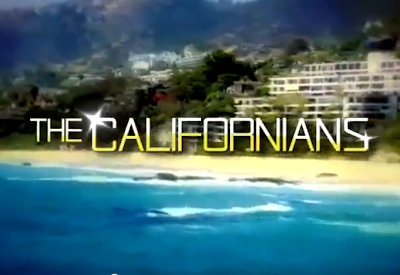 While it's called "The Californians," it's totally an L.A. thing - specifically "the westside." Creative, and very funny. I haven't watched SNL in years - but thought this clip was worth watching. This is also one of those skits that should have been done once. The jokes, humerous the first time through, get a little stale as SNL has tried to keep this series going for additional weeks. I think there's something emotionally healthy laughing at yourself, and knowing how you're perceived by others. Even if it's via a silly skit. A couple weekends ago my family and I were back in Los Angeles and had a chance to spend an afternoon at the Aquarium of the Pacific in Long Beach. Here's a link to Part I from last week. Above, one of the many lorikeetes (similar to parakeets, but native to Australia). It's something you won't find at most Aquariums. And, thanks to Los Angeles' wonderful Mediterranean climate, can be experienced outdoors year round. 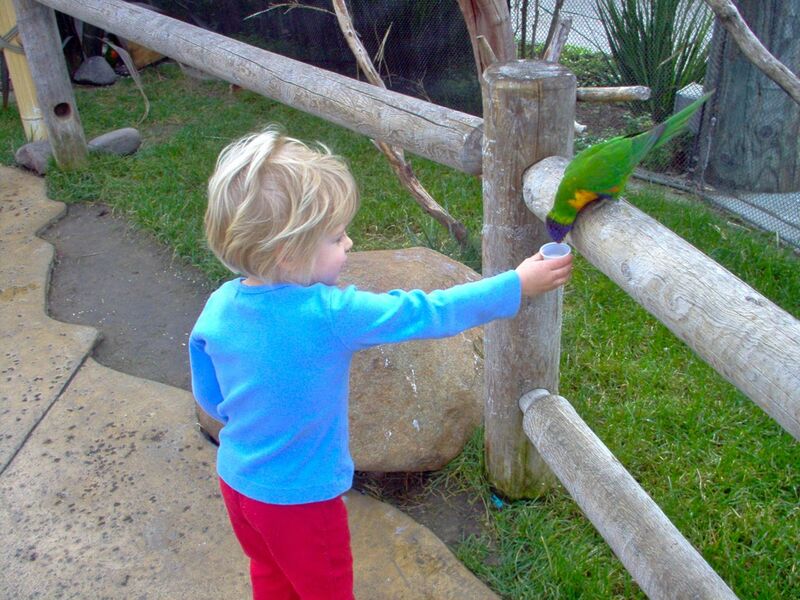 For three bucks you can purchase a little contained of nectar, which - of course - attracts the lorikeets. 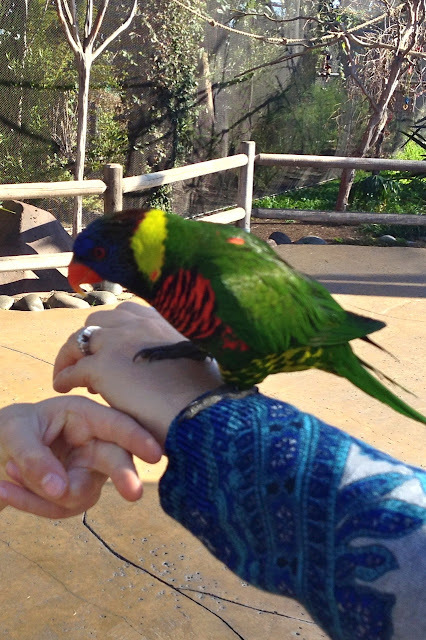 Above, my wife and daughter - and two happy lorikeets. I love the expression of this kid looking at the lorikeet on my wife's arm. 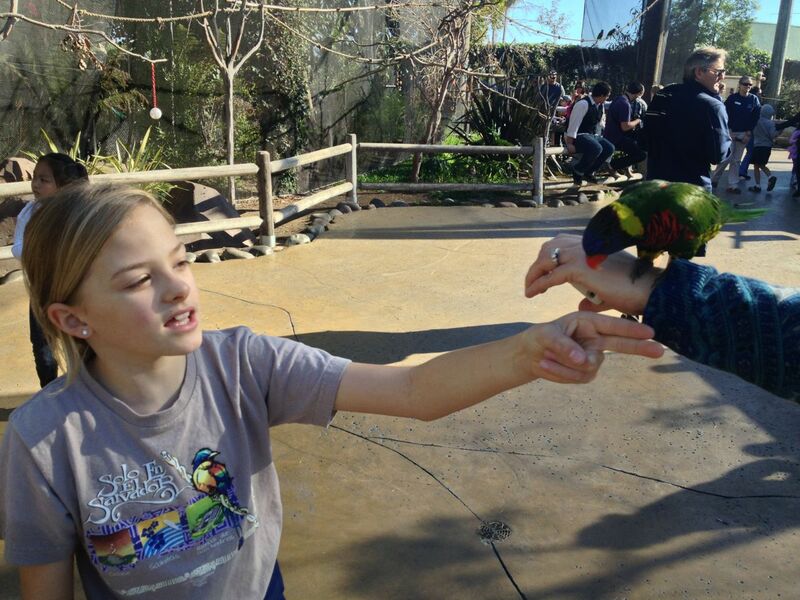 And the happy expression of my daughter. Wow, the years have really flown by. My son was at the other end of the aviary, with a happy lorikeet on his arm. 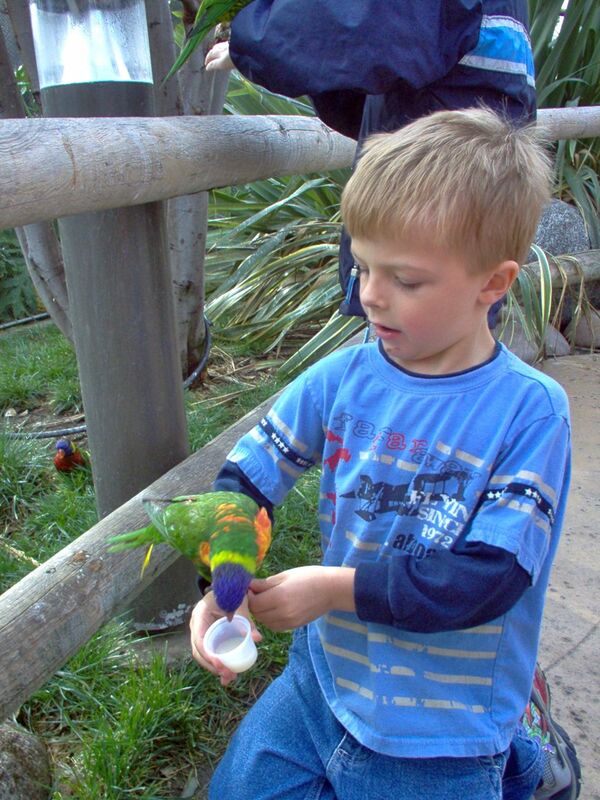 December 2004: my son eight years ago at age 5. My son seemed so "big" at the time, especially compared to his little sister. We had a chance to visit and speak at a church earlier that weekend. Afterwards, an older friend, now in his 70's, came up to me and told me that the next few years of our kids lives will go by very quickly. 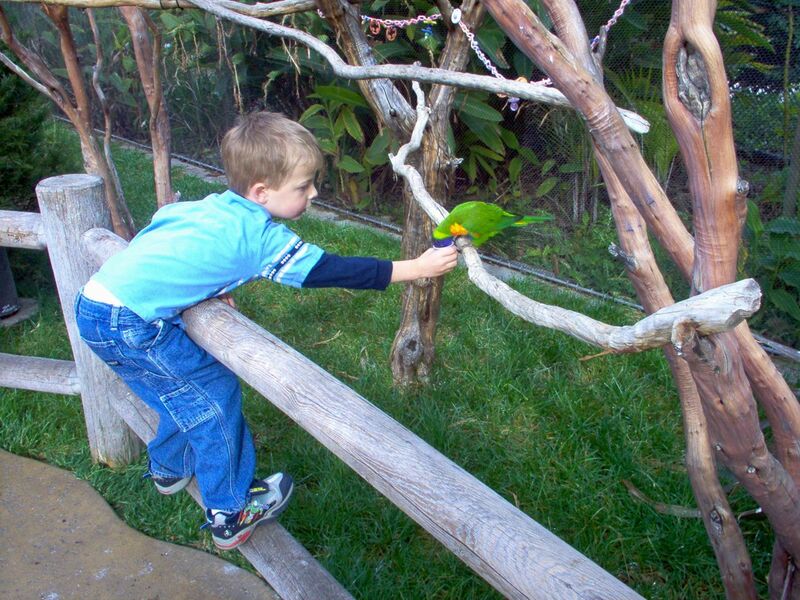 Looking at this photos from just eight years ago, there's a lot of wisdom in that statement. As I've shared before, my wife and I have are committed to imparting our faith and our values to our two kids. 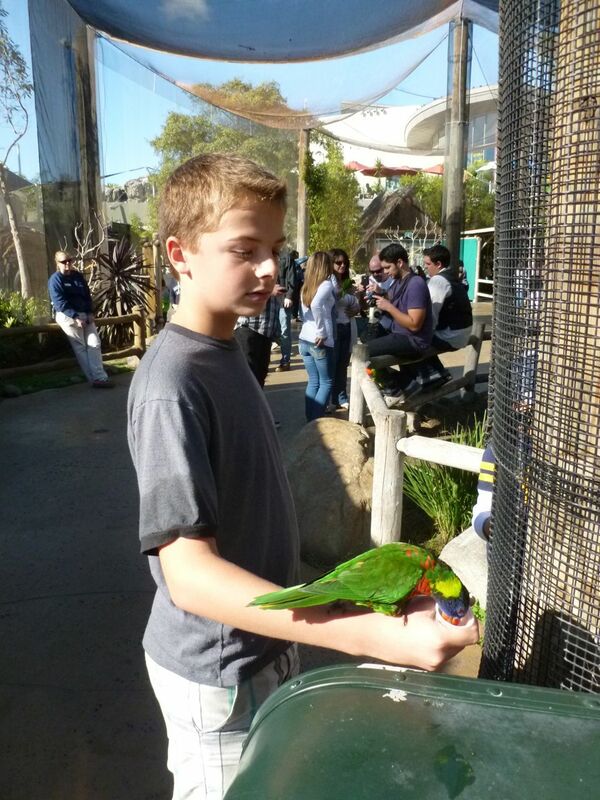 Now that my son is 13, daughter 10 1/2, we really see the years marching by quickly. We were there on a Sunday afternoon. Probably not the best time to go if you want to avoid the crowds, but in that we're no longer in the area, we don't have nearly as much flexibility. Felt like the staff at the Aquarium did a great job, even on a busy day. 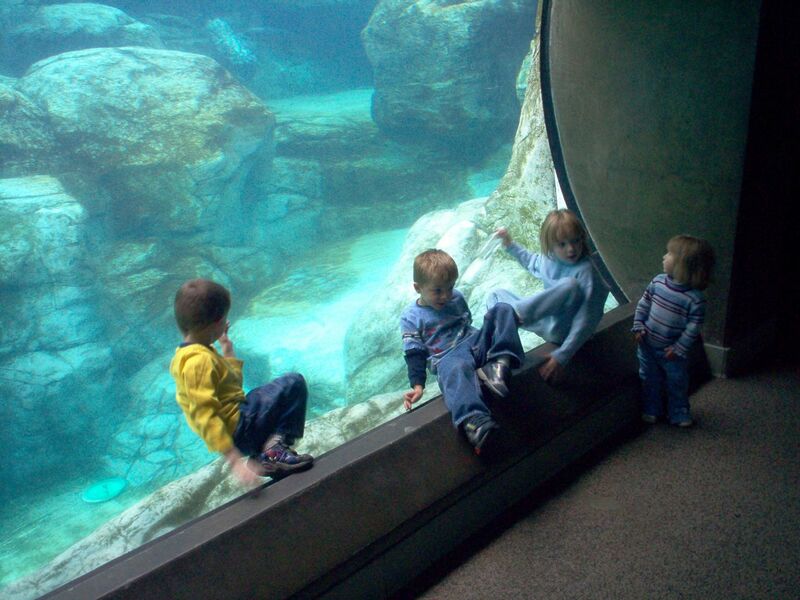 Another photo from eight years ago, my kids (center) with two of their cousins. My niece in 2004, now age 14. Divers in the large display tanks. 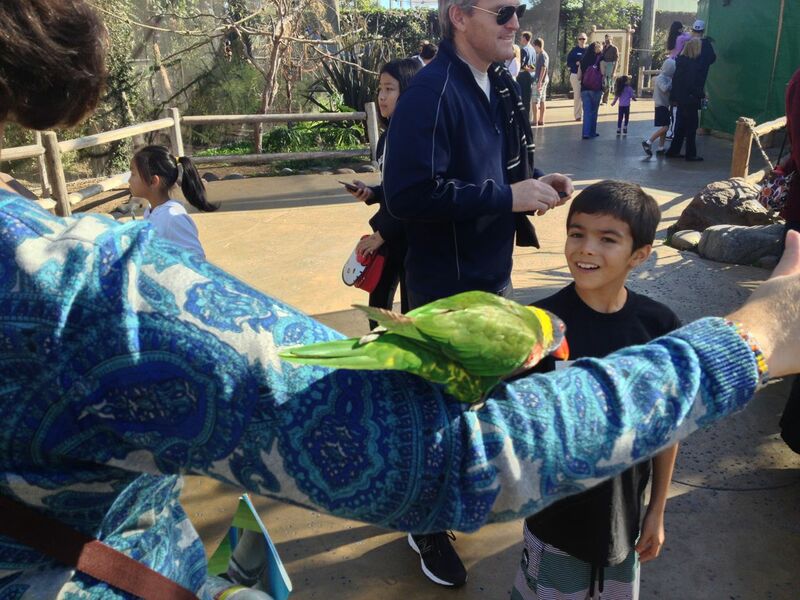 The little boy was fascinated by it, as were my kids when they were his age. Pretty cool having these divers talk about the oceans and sealife. 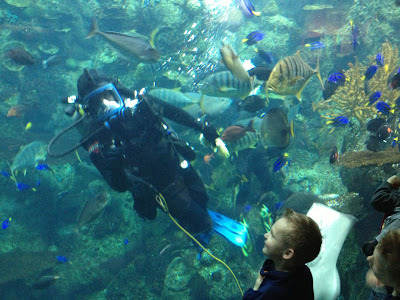 Afterwards, the divers gave a high-fives to all the kids through the glass. 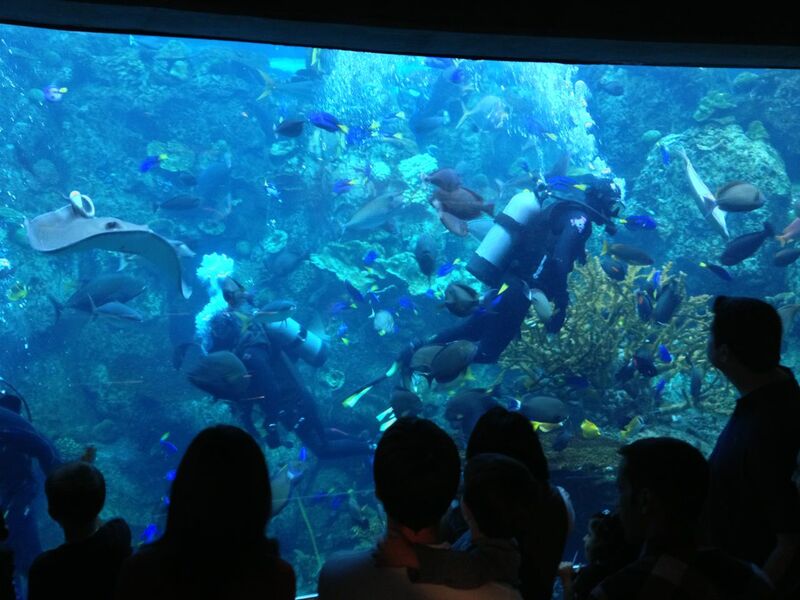 Lots of school groups are here during the week: pretty incredible "classroom." 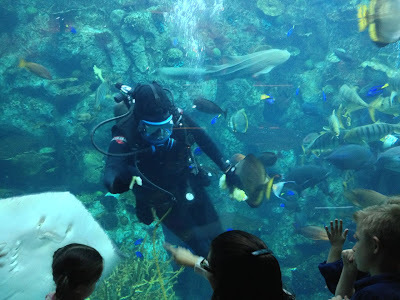 Like other aquariums, the Aquarium of the Pacific is committed to the important work of education and the conservation of the oceans for for future generations. 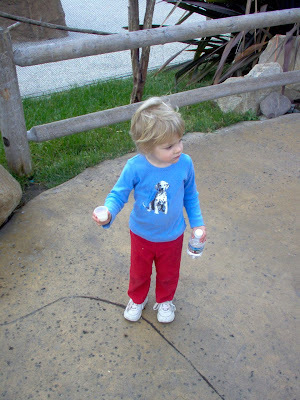 One final picture from December 2004: my wife with our daughter (in the bright red pants). 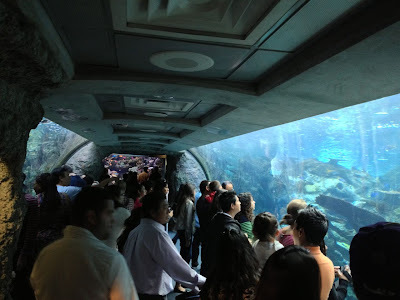 Glad we started taking our kids to the Aquarium then. 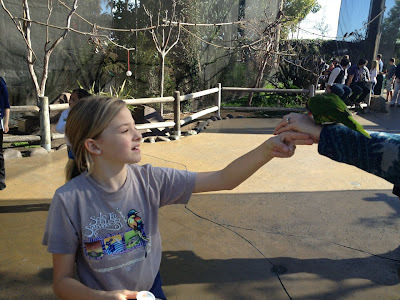 Glad we took them again a couple weeks ago. 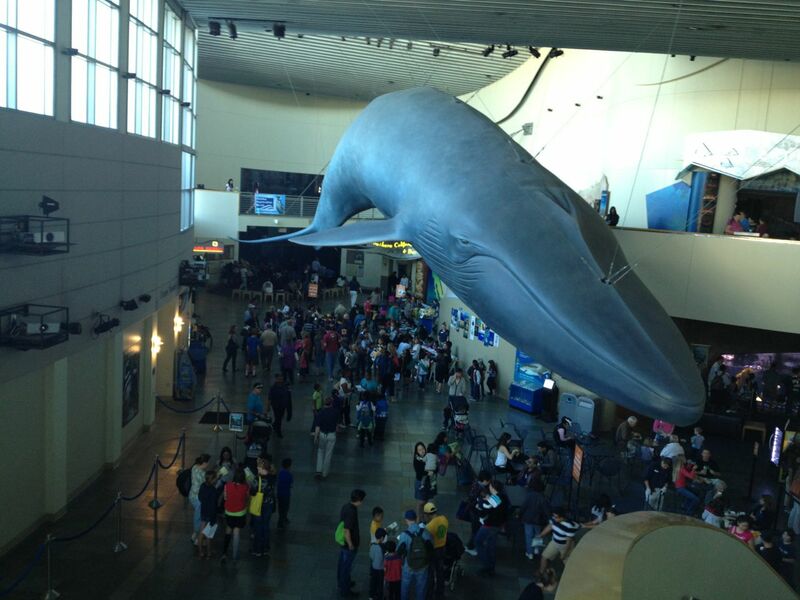 A view of the lobby, with the massive life size sculpture of a Blue Whale, largest animal on earth. 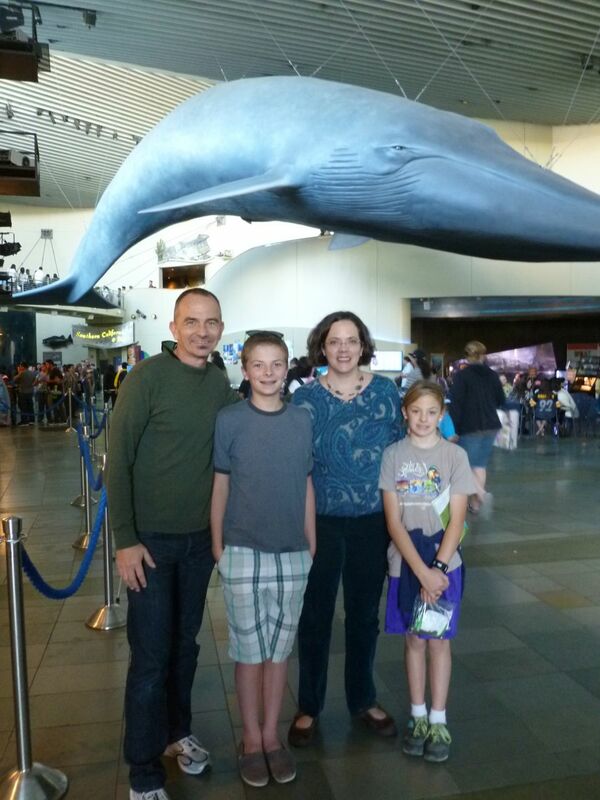 Final family photo. Good times. Here's a link to the Aquarium of the Pacific's website. Check on-line for discounts. We save a bit of cash by buying our tickets ahead of time at our local AAA office.